Heydar Aliyev Palace will host a festive evening on June 12. 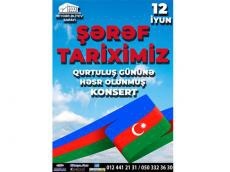 The gala concert is timed to the Day of National Salvation, which is celebrated in Azerbaijan on June 15, Trend Life reported. Performers of folk songs and mugham, classical works - People's Artist Gulyaz Mammadova, Honored artists Adalyat Shukurov, Gulustan Aliyeva, Elza Seyidjahan, Zaur Amirsalanov, singers Nazim Phaetonchu, Narmin Karimbayli, Yashar Jalilov, Leyla Ramazanli, Kenul Mammadli, Abdul Khalid,Tofig Hajiyev, Nijat Jafarzadeh, Rosa Zargarli, Elkhan Garakhanoglu will perform at the concert. Ticket price: 10- 40 AZN ($6-$23). Tickets can be purchased at all ticket offices of the city, Ganjlik Mall and 28 Mall, as well as website www.iticket.az. June 15 is one of the most remarkable days in the history of Azerbaijan’s statehood. The day celebrates the National Salvation Day -- the beginning of a new and invaluable stage in the history of independent Azerbaijan. For Azerbaijanis, this is one of the country’s most memorable days, marking the historical return of the national leader Heydar Aliyev from the Nakhchivan Autonomous Republic to capital Baku in 1993.